I started gathering photos & memorabilia last month to help me share my teenage driving stories! I knew the topic in the Inspired Scrapbooking workshop this month was going to be Family Stories, so I wanted to be ready. These are the stories that are told over & over again when our family gets together. I started out by typing up a draft of the stories, then I called and read them to Mama & Daddy and my sister Brenda. They helped me remember additional details and even shared some things I don't remember. I ended up with a ton of journaling, so I decided to use both sides of a 6x12 page protector for the stories and a 12x12 layout for the photos & memorabilia. Here's a look at the 6x12 pages. I love to drive; I always have! Even now in my 40s, I’m always up for a road trip with Robbie and am more than willing to do my share of the driving. I consider myself a very responsible driver now, following all the traffic laws and rarely going more than 4 miles over the posted speed limit. But, it wasn’t always that way . . . as evidenced by the numerous stories that Daddy (& Mama, too, on occasion) often re-tells about my teenage driving years. Mama & Daddy bought a brand new Plymouth Horizon when I was 14-years-old, knowing it would be my car when I graduated from high school. I remember picking that car right off the show room floor. I pretty much learned to drive in that car, a red five-door hatchback with standard transmission. The first day I had my driver’s permit, Mama let me drive to the mall. On the way we stopped at the Rec to drop off Brenda and one of her friends, who were riding in the back seat. I stopped in front of the Rec and heard the back door open then slam closed, so I took my foot off the brake and started going forward . . . only to hear the second car door close and realize I hadn’t waited for them both to get out and clear of the car. As it turns out, I ran over Brenda’s friend’s foot with the back tire . . . and broke it. (Ok, Mama said actually it just bruised her foot and maybe tore some ligaments, but I think the story sounds so much better if it was broken!) It would seem that this tragic event would have made me a cautious or fearful driver, but I don’t remember Mama & Daddy making a huge deal out of it. Mama took the girl to the hospital and they worked out the arrangements for the bills to be paid, but looking back I’m so glad they didn’t make this into something that would be a horrible memory. It was a terrible mistake . . . that I never made again, but I was spared a lot of grief by the fact that they didn’t turn a mistake into a guilt trip. I was at the Driver’s License Office at 9 am on my 16th birthday – I wasn’t waiting another day to get my driver’s license. I passed the test with flying colors, only losing six points on one right-hand turn for not getting over close enough to the side of the road first. I was one of the lucky ones, having a car to drive to school and out on the weekends throughout my junior and senior years of high school. I tended to think that I could get away with anything, but somehow that never happened. Like the night I decided to teach Tracey to drive a stick shift – after hours of stop and go with her trying to learn to drive, it was time to head home. I got behind the wheel and turned right off the drag onto Twin City Highway. I said, “Once you get the hang of it, you’ll be able to drive like this” as I popped the clutch and sped off from a red light. It’s not really my fault that I liked to drive fast; it’s actually Daddy’s fault. Seriously! I remember being stopped at a red light one time, on the way to church, when Daddy pulled up beside me in the Ford Fairmont and starting gunning the engine – an invitation to race that I just couldn’t ignore. I don’t think I ever outran Daddy, but me and my four-cylinder engine sure did give him and his V8 a run for his money! I was only in one accident during those years; late one weekend night, Carla and I were on our way home from a dance. Once again, we were headed down Twin City Highway, but this time most of the lights were blinking yellow (it must have been after midnight). As I came out from under the Hwy 73 overpass, a car on the access road ran the blinking red light and hit my car, starting at the front passenger side and continuing all the way to the back bumper. I came to a stop in the middle of the road! Luckily, some guy friends from school were passing by at that time and stopped. They pushed my car out of the road into a parking lot and started changing the tire while Carla went to locate a pay phone to call Daddy. When she told him that we had been in an accident, Daddy asked, “Who did she hit?” Carla assured him the accident wasn’t my fault and shortly after that he and Mama showed up at the accident scene. The other driver was cited and their insurance paid for the repairs to my car. There’s a little detail in that accident story that I never shared with my parents until many, many years later. A few weeks before, I had lost one of my contact lenses, so I had to wear my glasses for a while until my parents could save up the money to replace the contact. I hated wearing my glasses, so I had put one contact in that night and had not worn my glasses at the dance. On the way home, however, I had my glasses on, but either way I could only see good out of one eye! Even though the accident wasn’t my fault, I never again pulled a stunt like that where I couldn’t see my best while I was driving! Mama & Daddy had a little party for me at the house after my high school graduation and one of my favorite gifts was all the keys to my car! I was lucky to get to drive it most of the time, but it was still technically a family car during my high school years and could be commandeered by Mama or Daddy at any time for their own use . . . but that night it became officially mine and anyone who wanted to use it had to ask and borrow a key! Lucky me that Mama insisted that all her girls own their own car when they graduated from high school and set out in life as an adult! I’ve had my own car ever since that time, and I still enjoy driving, but I no longer race and have finally grown up enough to appreciate an automatic transmission! For the 12x12 page, I created a pocket to hold memorabilia (my driving test, receipts for driver's ed, temporary permits, tickets). . . and discovered a few stories I had missed! 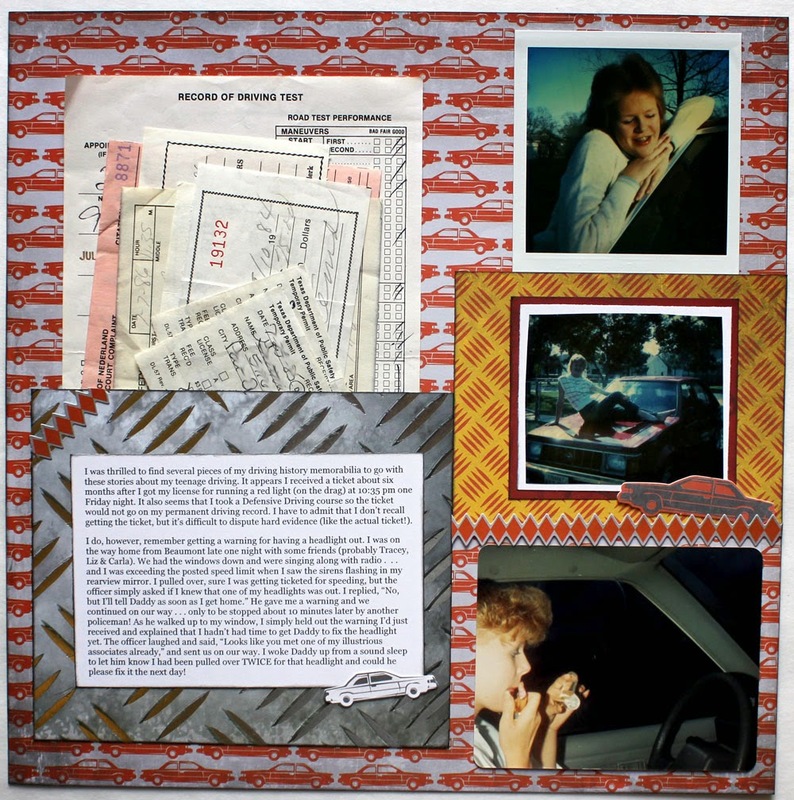 So, I added a little additional journaling to this page, along with photos of me and my car. 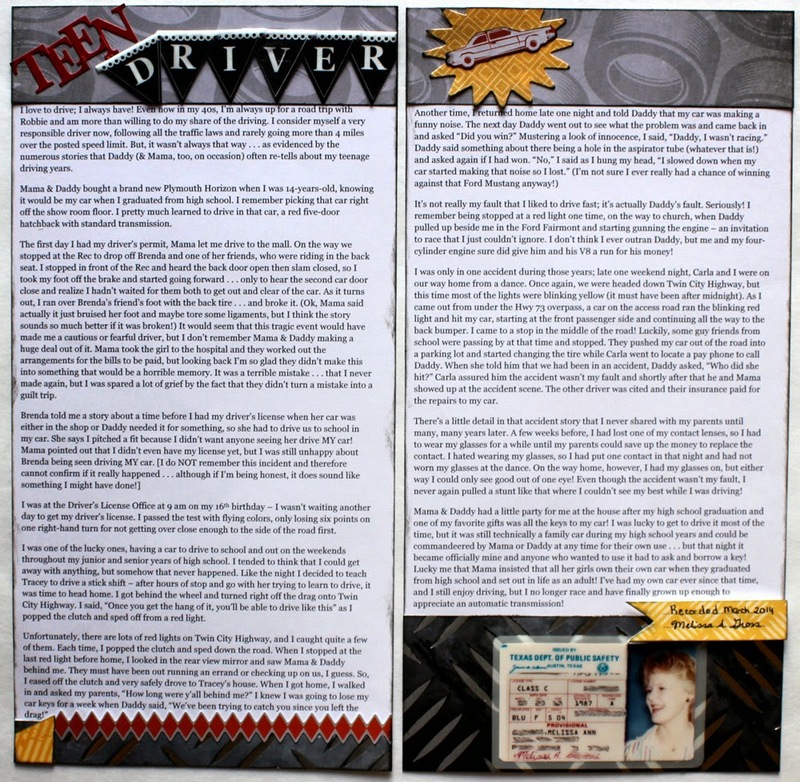 I was thrilled to find several pieces of my driving history memorabilia to go with these stories about my teenage driving. It appears I received a ticket about six months after I got my license for running a red light (on the drag) at 10:35 pm one Friday night. It also seems that I took a Defensive Driving course so the ticket would not go on my permanent driving record. I have to admit that I don’t recall getting the ticket, but it’s difficult to dispute hard evidence (like the actual ticket!). I do, however, remember getting a warning for having a headlight out. I was on the way home from Beaumont late one night with some friends (probably Tracey, Liz & Carla). We had the windows down and were singing along with radio . . . and I was exceeding the posted speed limit when I saw the sirens flashing in my rearview mirror. I pulled over, sure I was getting ticketed for speeding, but the officer simply asked if I knew that one of my headlights was out. I replied, “No, but I’ll tell Daddy as soon as I get home.” He gave me a warning and we continued on our way . . . only to be stopped about 10 minutes later by another policeman! As he walked up to my window, I simply held out the warning I’d just received and explained that I hadn’t had time to get Daddy to fix the headlight yet. The officer laughed and said, “Looks like you met one of my illustrious associates already,” and sent us on our way. I woke Daddy up from a sound sleep to let him know I had been pulled over TWICE for that headlight and could he please fix it the next day! I know it's a lot of journaling, and I truly appreciate those of you who took time to read through it all. I hope these stories brought a smile to your face or made you laugh out loud today! Do you have any memorable teenage driving stories? I'd love for you to share them in the comments. These are my favorite types of layouts. I think they are especially interesting. In the future, when things regarding driving are so different, people will be fascinated to see how things were "back in the day." I'm about to restart learning to drive - so your stories fascinated me :) So pleased you've taken the time and I like that you rang your family up to get their additional ideas too. As far as I know there's only one or two stories about my learning to drive, but I loved every one of yours! I'm amazed that you were able to find all that memorabilia. You must have had a scrapbooker's heart even then. I also learned to drive on a stick - a VW bug. Ask my Aunt Carol about the time I did a right hand turn in 3rd gear - probably at about 35 mph in a 25 mph zone. I was actually a cautious young driver and in no hurry to get my license. I knew having it meant I would be conscripted as chauffeur for all my younger siblings. Great stories - glad I wasn't in the car with you when you were a teenage driver! I can attest that you are a good driver now though. I think my sister would probably tell you about the time I went round a corner way too fast when I was learning - we had groceries in a bag on the front seat and she shouted - Sian you've just turned that cabbage into coleslaw! Just brilliant to read all your stories and I am always moved and enthused by your scrapbooking in detail and the way you add so much memorabilia. Somewhere your future self just knew you'd be a scrapbooker :).